Why should I apply mulch? Mulch is a protective coating applied to landscape beds. It will aid in weed prevention, reduce watering, maintain moisture in the soil & prevent erosion as well as add beauty to the landscape. You can apply mulch safely any time during the growing season however it is best to apply it to exposed soil in the spring to prevent weeds & in the fall for winter root protection. What mulch should I choose? Mulch comes in a variety of textures & colors. The mulch you choose is mostly personal preference. Hardwood Mulch is one our most popular variety. It is an all natural shredded material that is black in color when wet, brown to light black when dry. Cedar Mulch -One of the most attractive and unique mulches available. It consists of yellow and red heart-wood resulting in beautiful coloration and a pleasant aroma. Aromatic cedar mulch is a top-choice for gardeners and landscaper who prefer fragrant, low maintenance mulch. It is durable and is highly effective in reducing weed growth. Cypress Mulch – Produced from the bark of the cypress tree. It is one of the finest and most attractive natural and chemical free mulches available. This mulch stays in place and is excellent for sloping landscapes, playgrounds, and any landscaping projects that demands effective and visual appealing mulch. Pine Bark Mulch, Mini Nuggets & Large Nuggets – This mulch is chipped rather than shredded. The chips come in 3 sizes & it is dark brown in color. The mini & large nuggets provide an interesting texture to the landscape & is often used in mulched paths. The benefit of this mulch is that it slowly decomposes so it lasts a long time. Pine Straw – As the name implies, pine straw comes from pine trees, which shed their needles in the fall. Once the needles drop to the ground, they are raked, cleaned and baled without the need to cut down or harm the trees. This makes pine straw a very environmentally friendly choice for a landscaping and mulching material. Pine straw is a very light product making it the easiest product to apply and the best choice for hard to mulch areas or steep grades. Quick Straw– Compressed bales of pine straw. 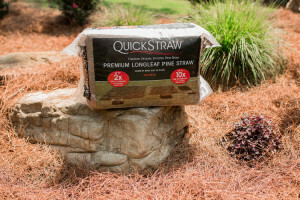 One package of Quick Straw contains more straw than two loose bales of the same material. Once opened, the material expands and spreads easily. Easy to haul and no mess! 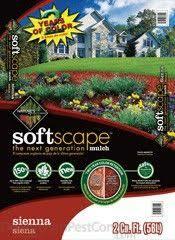 Softscape – Softscape Mulch features a unique, soft textured mulch that will boost the beauty of your home and will establish a professional look for your landscape. It is tender on hands and feet, and it is certified safe for kids and pets. Softscape is made from virgin forest materials and its color has been improved by an environment-safe colorant. It offers long color retention for four years. Contrary to other mulches, Softscape does not condensed and quash plant roots from water and nutrients, it further permits water and air to enter the soil of flower beds and landscaping projects. Wheat Straw – A easily decomposing mulch to cover seed to aid germination. Go out & step off your beds where you will be applying mulch. Measure the length & the width. Multiply the length times the width to determine the square footage you need to cover. Do not worry about being precise when measuring curves etc. just try to get the bulk of the area. Then decide how deep you want to apply the mulch. We recommend 1-2 inches per year. I have listed a guide to help you decide the quantity you will need. For example: If you have an area that is 100’ feet long & 10’ wide and you want to apply mulch 2” thick you will need approx. 6-6.5 cubic yards of mulch. 100 x 10 = 1000 square feet divided by 162 = 6.17 so you would need approximately 6-6.5 cubic yards of mulch. If you have trouble with this we’ll be glad to help. Do not pile mulch up high near the trunk of the tree. While this is commonly done because it looks nice it is not good for the tree and can cause the health of the tree to decline. It is best for the tree if the flare at the base of the tree is left exposed. Pull or spray weeds before applying mulch. Mulch will prevent weed growth however weeds are tenacious so if they are actively growing when you apply mulch they may grow through. More is not better. Do not apply mulch more than 3” thick unless you absolutely do not want to grow anything there. Any more than 3” and the top will dry and shed water and the soil will stay too wet. Soil must breath to allow roots to grow. It is better for landscape plants to refresh the mulch each year rather than put a lot on at one time.